The next few months will be filled with bushels of delicious fresh fruits and wholesome grains and dry goods. Here’s what’s in sight. Each of these upcoming truckload sales will offer a great selection of whole grains and dry goods. Our Michigan orchard has produced a bumper crop of apples for us. Beginning with Galas in late August or early September, we plan to haul in several truckloads of crisp, juicy apples throughout the fall and into December. These European gems are unlike the plums we commonly find at grocery stores. Wildly popular in Germany and eastern Europe, the Stanley plum’s firm, sweet-tart flesh makes it an excellent choice for canning, kuchens and other baked delights, and for drying. Of course, they are wonderful enjoyed fresh as well. Stanley plums will be available only once in early September. 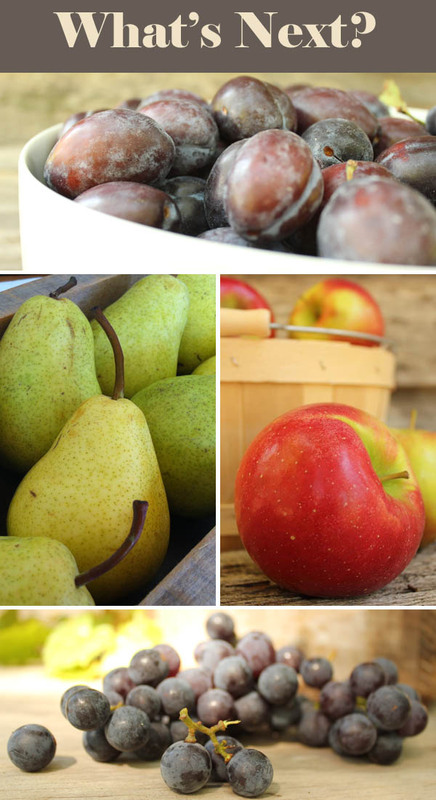 Juicy, sweet, and speckled, Bartletts are the quintessential fall pear. Put them up in jars, gobble them fresh, and bake a simple pear tart that looks and tastes like gourmet. Bartlett pears will be available only once in early September. If you’ve ever tasted commercially-prepared cling peaches in a can, you’re probably familiar with their terrific firm texture and delicate sweetness. Those are Baby Gold peaches, or some very similar variety. The Baby Gold is unmatched for putting up in jars. This peach also stays firm in all kinds of baked sweets; pies, cobblers, tarts, and muffins. However, be forewarned: Baby Gold peaches are not well-suited for fresh eating. Their flesh is almost rubbery when raw, certainly not juicy. Furthermore, this is a cling stone peach, so be prepared to cut it away from the pit for processing and cooking. Baby Gold peaches: unsurpassed for baking and canning. Not so good for fresh eating. Baby Gold peaches will be available only once in early September. We’re not sure about the grapes for this fall. It takes a good sized group of people to hand pick Concord grapes for us, and fewer pickers than usual have signed on to help at the orchard where our grapes come from. If we are able to offer grapes, they should be available in late September, early October, or both. Did you ever wonder why grape flavored candies taste almost nothing like common grapes? Those grape candies are made to taste like Concord grapes – the deep purple, slip-skin, sweet grapes that Welch’s purple grape juice is made from. These grapes make awesome juice – easy to do in our Mehu Liisa steamer juicer. Turn ’em into wine, freeze the grapes whole (mini ice pops, right? ), or eat Concord grapes straight out of the box, which is what most people do.